If you decided to spend your holiday in Roquetas de Mar , my reviews and pre-selected list of Hotels of this resort may help you planning your vacations. Those that are missing are either those I do not know enough or those I would not recommend. These Hotels are all located at the beach front and/or a short walking distance to the Playa! Best of all: The rates! 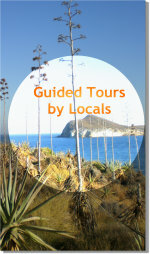 Almeria is one of the most economical Spanish holiday destination, as repeatedly published by local mainstream media. An excellent 5-star Hotel with Biomar Spa, ideal for a wellness break. Right at the Serena Beach. If you are looking for quality and beachfront location, this is the one! Check out their promotions! Childrens Free! Recently refurbished in 2012 and reopened. Decorated with a bold, modern style. The pool area and gardens are very inviting and it is the perfect place for a family holiday!